If I was going to give one piece of advice, I would say don't be afraid to fail. I think by nature, we all are a little scared to fail. We're scared of what other people are going to think of us if we fail. What are my friends going to think? What's my wife going to think? What are my kids going to think? Am I going to lose the respect of others? 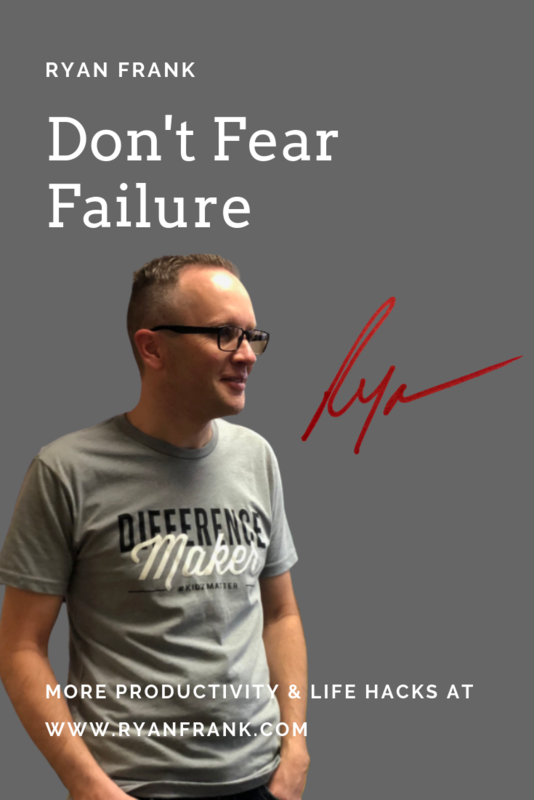 I've learned to embrace failure, and I have a file folder full of failure stories and things that we tried that didn't work; time I invested in something that didn't work; money I spent on something that didn't work; partnership that didn't work. The key is to grow through that failure and to get better. I don't think I'm really creative; I'm just not afraid to fail. I'm willing to roll the dice on something and try it. Now I think the key is, as I said a minute ago, you have to be willing to learn through failure. If I fail and I don't learn from it, then I'm on a path that's going to lead to problems. But if I can really learn from the failure and own it, it will take me places. John Maxwell has a book called Failing Forward, but it's the idea of like falling forward, you fail forward. You embrace failure, and you learn from it. I just wouldn't be afraid to try things. Go with your gut. Go with your instinct. Lean in on the people that care about you. If you get a big idea and it's a God idea, run with it. Be smart along the way, but don't fear failure. Normally people in ministry, people in the business world, if you study modern history, and you go back hundreds and hundreds of years, people who really accomplished the most have a track record of failure. They failed, but they got back up. They failed, but they got back up. I don't want to get to my grave with too many wishes, too many regrets. Like, "Man, why didn't I try that? Why didn't I try this?" I'm willing to fail, and I don't really care what people think, which is a big piece of the puzzle. We get way too concerned with what people think. I think the quicker somebody can just be good with the fact that this is who I am and this is what God wants me to do, this is what I believe God wants me to do, and I don't care what you think, the better off you're going to be. But we get stuck in this trap of caring what people think, and it costs us. Don't care what people think. Go with your gut. Don't be afraid to fail. Dream big. I think within each person, no matter what you're willing to do, God puts big dreams inside of you. You’ve just got to be willing to go with them. If God Called You to it, You Are a Giant!